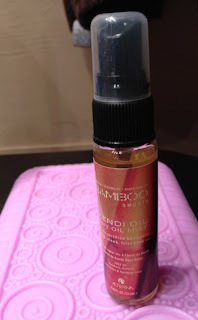 The light Alterna Kendi Dry Oil misted on with ease and helped my hair lay nicely -- no frizz here -- and the light smell was perfect. It added a little shine and created the perfect finish after flat-ironing. It even helped stubborn ends straighten after a recent haircut. This product also claims to be filled with nutrients and is safe for color-treated hair. I have to admit products like this have turned me from being terrified of hair oils to absolutely loving them! KEEP OR TOSS: Keep. This item is going on my wish-list. CHECK IT OUT: Although Alterna is not quite a household name, the brand is really starting to be more commonly available. You can find this product at Ulta.